Collectively, these were some of the most formative rock and roll recordings for me. Just starting high school at the time, I became a bit of a Dylan freak for a while. The Band was still part of the picture, but I didn’t get crazy obsessed with them until 2000, when Capitol re-released the first part of their catalog, all re-mastered with bonus tracks. I scooped those up, and listened to them repeatedly. They were like brand new discoveries. I also read a few books about The Band, including Levon’s autobiography. I was steeped in it. Living in Brooklyn at the time, my then wife and I had already decided to take a long weekend to visit Woodstock. It’s a quaint, beautiful town in upstate New York, whose name everyone knows from the music festival that was almost there. It also happens to be where Bob Dylan and The Band created some of the most amazing and lasting music that any American artist has ever created, then or since. There are interesting, musically historic spots all over the Woodstock area, including the house where The Band wrote the songs for their first record, Music From Big Pink, and where they recorded The Basement Tapes with Dylan. That’s the one I wanted to see. The house. Big Pink. I found a Web page with some directions written out. It involved unmarked roads and warned against trespassing. Local people had gotten tired of the Dylan freaks. The hunt for the house did send us down a number of unmarked roads with lots of no trespassing signs along the way, but we did eventually find it. It was underwhelming. And why wouldn’t it be? Just an old house in the middle of nowhere. Some really big things happened here, yes, but they aren’t reflected in the structure itself. I dashed off a few photos with my camera, and we got back in the car. There wasn’t anyone around, but it still felt like we shouldn’t be there. It was time to go. 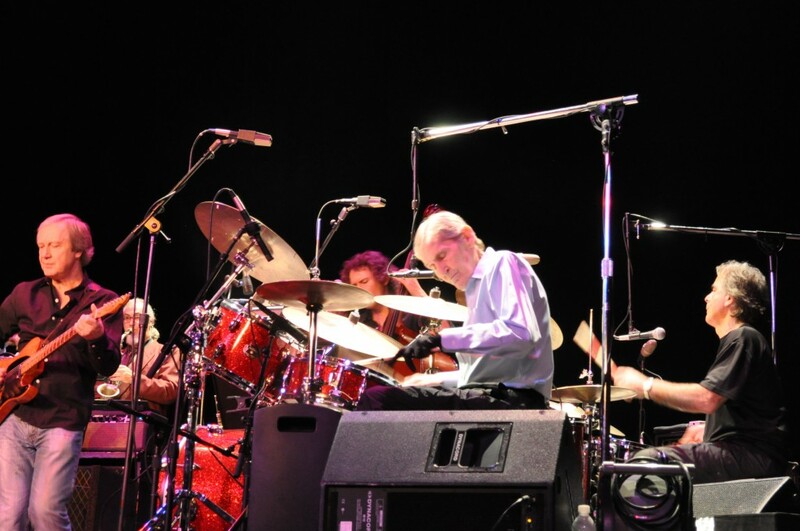 So you might understand how excited I was when I saw the Levon Helm Band was coming to Ann Arbor, just a few miles from me at The Michigan Theater. Levon Helm. The most recognizable voice in The Band. The only Southerner in the bunch — the only American (the rest were… Canadians!). Throat cancer survivor, road warrior, and three time Grammy winner. Drummer extraordinaire. Bringing his well seasoned 13 piece band (yes, that’s thirteen) to town. I had to go. And it was great. What we saw wasn’t a run through a selection of The Band’s greatest hits (which everyone would have loved, by the way, myself included). It was a journey through the rich and varied landscape of American roots music — the music that forms the bedrock of rock and roll. Which isn’t to say that there weren’t any songs by The Band in the setlist. The show started with “This Wheel’s On Fire”, followed a few songs later by “Ophelia”. Later there was a fantastic “Chest Fever”, starting with a guitar-driven “Genetic Method” from bandleader Larry Campbell. The finale was “The Weight” with Joe Pug (opener) and his bandmates. In the spaces sandwiched between these classics by The Band, we heard country, bluegrass, folk, R&B, and more. A kind of late 60s heavy rock number, too. With two drummers, three multi-instrumental vocalists, a guitar player, keyboard/vocalist, bass player/vocalist, and a five piece horn section, the band was able to traverse any musical territory it wanted. On a few occasions, the horn section stepped off stage for a song or two. On other songs they were featured — like in their strut around stage during the cover of Wild Tchoupitoulas‘ “Meet the Boys on the Battlefront”. The crowd went nuts for it. By contrast, another song, “Little Birds,” featured just one guitar, a mandolin, fiddle, upright bass, and two vocalists. Still another changed the configuration to an an accordion, 3 guitars, bass, two drummers. And, of course, a trombone, for the trombone solo. So the concert was absolutely fantastic. I didn’t know most of the non-Band songs they played, but each one really grabbed me. All for different reasons. Larry, Teresa, and Amy all have tremendous stage presence and the entire band has great chemistry on stage. They weren’t only fun to listen to — they were fun to watch (see the 2010 audience recording of “The Weight” below). Unfortunately, I was also reminded of why I generally don’t get excited about rock shows at The Michigan Theater (except the Earth moving ones like this one). It’s a great place to see a movie with my kid, but a pretty stifling atmosphere for a rock and roll concert. The seats are bolted into the ground, and rows run all the way up to the stage. Standing up in your seat is generally frowned upon and there’s no where to stand up and dance. Sound is generally good, though, and site lines are pretty good wherever you are. Still, there’s just no rocking out. Despite that, the show really did blow me away. The one thing that leaves me scratching my head is, why no tapers at the show? And why no option to buy a recording of the concert? Why not sell copies? There’s gold in them hills! They’re already taping the shows, I imagine. Run off some copies, sell them at $25 a pop. Instant memories for the fans. A little extra cash for the band. The band would benefit if they let tapers record and upload recordings to the Live Music Archive. It builds exposure, rewards the fans, and preserves their live work for future generations to hear. 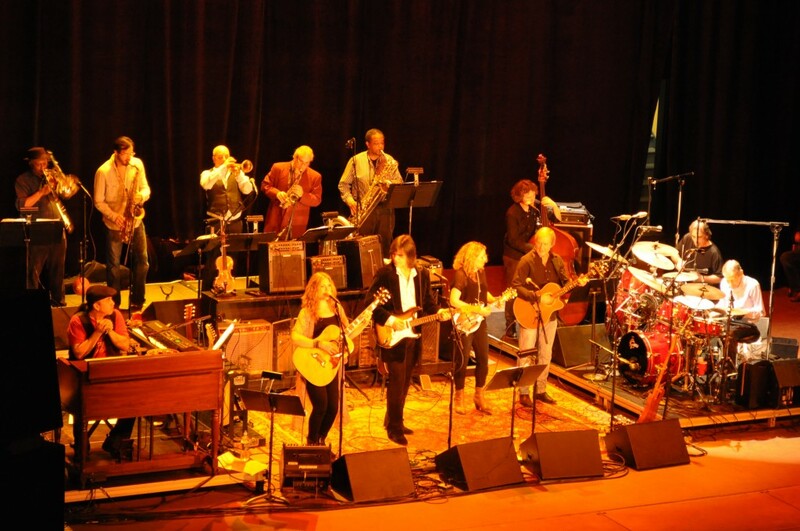 Since I can’t link to any MP3s on the Live Music Archive, you’re going to have to see the Levon Helm Band for yourself. Which you should do anyway. It’s a great show, and you’ll probably get caught up in the energy of it. Check out this audience recording from 2010 to see what I mean. Photos by Mike Vasquez. See more here. Nice piece! Great venue to have seen him play, I bet. I’ve gone back to this Salon article which features some live material and a cool interview a few times in the last few days. Pretty amazing. This was indeed a great show. And a phenomenal review. Great review! and a great show. Days later I still feel uplifted thinking about it. Just one comment, As I was sitting just behind the sound engineers. it was obvious they were taping it. What if anything is gonig to be done with those tapes is anyone’s guess. @Joshua, thanks for the comment and the link. That’s a nice piece at Salon. @sab, I keep hoping they’ll show up on the line up for either All Good or Summer Camp. @Folklive, I wish they’d share those recordings… At least there are a few good YouTubes of them.